The cozy Danish tradition of hygge meets sustainable living in this hand-poured soy candle that casts a warm glow and has a subtle scent. Candle all done? The handmade pot can be repurposed into a mini garden, thanks to a label made from non-GMO wildflower seed paper. Burns for 45 hours. Candle is Made in the USA. A move from Florida and a particularly dreary winter had Hyggelight Makers Cyndi and Chris Hileman feeling the blues. They decided to embrace hygge, the Danish tradition of bringing coziness and contentment to your space. Burning candles did the trick, but they soon realized they were generating too much waste tossing the empty containers out. The Hilemans began hand-pouring their own candles and reusing the pots, and Hyggelight was born. The soy candles’ sustainable mission now goes one step further. 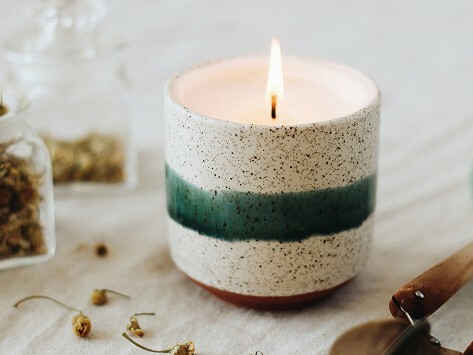 When the candle is done, its seed paper label can be planted in its handmade pot to grow a mini wildflower garden and keep the hygge moment going. Watch your garden grow and feel good that you didn’t toss an empty candle container into the trash. The candles are made in partnership with Lott Industries, which employs people with developmental disabilities. The Hileman’s passion for sustainable living goes one step further. Making Hyggelight candles results in just one bag of trash every month and they are hoping to be entirely waste-free in the near future.